Yesterday, I had my mid-pregnancy ultrasound to check on baby girl's growth. After having scans every month with the twins, I got used to seeing them often and I've been dying to see a peek of my baby girl again! I also was looking forward to being reassured that she is, in fact, a girl. For some reason I just kept picturing the tech go, "Who told you it was a girl? It's definitely a boy..." But she didn't! I really am getting a daughter! So anyway, I got to bring my mom along with me since my hubby had to work. We both spent the entire time going awwwwwww at every move she made. She is measuring right on track and weighs a whole 8 ounces! It's always reassuring to see all her little parts and organs where they need to be and working properly. Watching the four chambers of her heart move up and down is so stinking amazing. 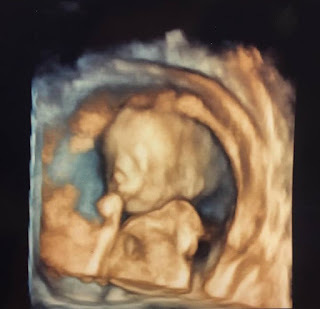 The tech showed us a shot of her umbilical cord connected to her and it was just so awesome... that is connected to me and is sustaining her! I'm sorry, but babies growing inside of you is just a miracle. I know, it's normal, but it's fascinating and makes me thank God for his intricate design! I'm so glad he didn't make humans egg layers or something weird. Less morning sickness, sure, but I wouldn't give up feeling her move inside of me and watching her grow week by week. And look how cute she is! At least I think she is. She had her little hands by her face the whole time and had her legs crossed at her ankles like a lady. I had a chocolate frosty right before we went in for the appointment and apparently that sugar went right to her, cause little miss didn't sit still at all. She made that tech work for every measurement and picture. Anyway, we're at 19 weeks today so we're almost halfway! I cannot believe how fast this pregnancy is going. I'm excited to meet her but also trying to enjoy any sleep the other three let me have because I'm quite confident I won't ever get any after she comes. I'm not exactly sure what I will do when she's here...it's chaos here most days and it will be interesting adding a newborn into the mix. But after having twin newborns, one must be a piece of cake... right? That's my hope, anyway. Either way, I'm so very blessed that it will be worth all the chaos and work and lost sleep!